Master Gardeners are volunteers from the community who are trained by the University of California Cooperative Extension specialists and other qualified instructors, who use research-based information to promote environmentally responsible and sustainable horticultural practices in the home, community and school landscapes. Grow LA Victory Garden Vegetable Gardening Classes. Basic gardening classes are held at many locations throughout LA County every spring and fall. See description and current schedule. Workshops and Consultation. Want some gardening workshops? Need help with planning a community or school garden? Request MG assistance by clicking here. Speakers. Looking for a presentation for your group on a range of gardening topics? Our Master Gardeners are experts in the areas of fruits and vegetables, drought-tolerant gardening, integrated pest management (IPM), irrigation, composting, container gardening and more. To request a Master Gardener speaker, click here. Have a Gardening Question? Email mglosangeleshelpline@ucdavis.edu with a description of your concern or question. Attaching photos will help the Master Gardener diagnose the problem. OR, you can phone in your concern or question by leaving a detailed message at (626) 586-1988.
eList. 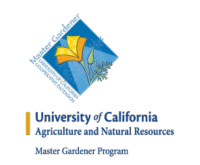 If you'd like to receive email announcements regarding our Master Gardener Volunteer Training Program, our Grow LA Victory Garden classes, and various other gardening events and classes, please click here to subscribe to our UC Master Gardener Program eList. Anything Else? Contact Valerie Borel at vtborel@ucanr.edu, (626) 586-1986. Acceptance into our annual training program is very competitive. Class size is limited to 50, and we usually receive more than 200 applications. Only adult residents (18+ years old) of Los Angeles County may apply. If you live in another California county, click here to locate the program in your area. The main criteria for acceptance include 1) prior community service utilizing gardening, 2) knowledge of gardening basics, 3) passion for helping other gardeners to garden sustainably, 4) experience giving public presentations, 5) working with people of diverse backgrounds individually and as a team, 6) initiative in starting and completing projects, and 7) basic computer skills and internet access. Our application period is from mid-November through the first week of January. Master Gardeners who graduate from our intensive 3-month training program (every Saturday from mid-February through May) must volunteer at least 50 hours during the first year. After that, Master Gardeners must volunteer at least 25 hours and participate in 12 hours of continuing education per year in order to maintain active Master Gardener status. The UC Master Gardener Volunteer Training Program application for 2019 is available now. The deadline is January 7, 2019 at 3 pm. The handbook is available to the general public. Order directly from UC Publications. Since 1993, we have trained 1,337 Master Gardener volunteers who have served 1,744,269 Los Angeles County residents and earned 74,291 continuing education hours. 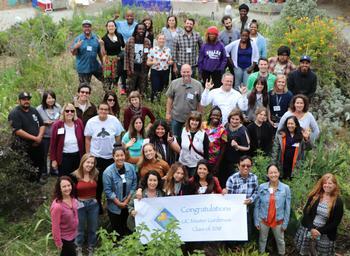 In 2017-18, our 264 Master Gardener volunteers logged 16,474 volunteer hours and 4,296 continuing education, hours helping 86,533 Los Angeles County residents at 330 locations (98 community gardens, 116 school gardens, 7 senior gardens, 9 homeless and battered-women's shelters, and 102 fairs, workshops, farmers markets and phone/email helplines).